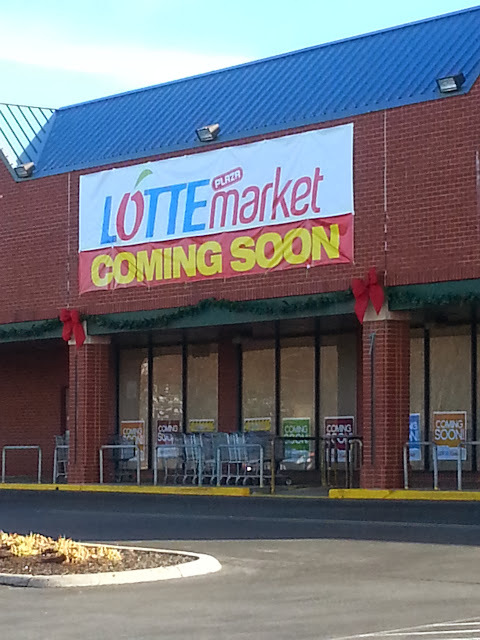 New Lotte Plaza opening at 221 Muddy Branch Rd, Gaithersburg, MD 20878. This place was previously a Grand Mart and from the sighn ( 28th Dec 2013) it looks like its going to be a new Lotte Plaza Market. Lotte is a grocery chain store with food and vegetables from Korea and other Asian countries. Lotte has branches in at least 8 other places in the DC area. We visit the Germantown branch often. The Muddy branch square also is home to India Bazaar for spices and food from the Indian subcontinent and a quite new Kerela Cafe. I am looking forward to seeing the new Lotte Plaza open.